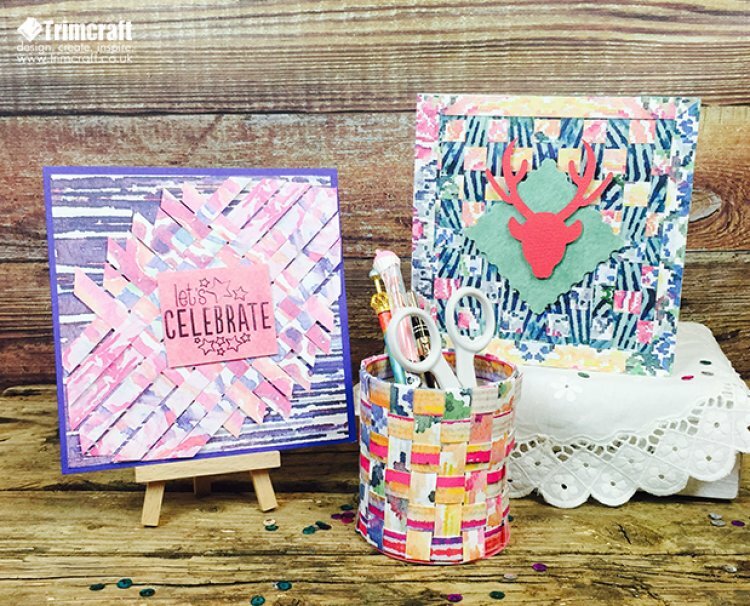 You can weave a fun pen pot or add a bright and colourful checkerboard pattern onto your next card creations simply with strips of paper! Dovecraft Back to Basics True Blue 6” x 6” Card Blank, 6” x 6” pearlescent card blank, Clear Stamp – Celebrate. 1. With your chosen First Edition 12” x 12” Kaleidoscope paper, cut eighteen 27cm x 1.2cm strips and then another eight 27cm x 1.2cm strips in a contrasting paper. We have picked a glitter paper to add a bit of sparkle and texture to our pen pot! 2. Place 6 of the 8 strips of paper on your work desk and weave in and out with the 18 pieces of paper. Push the papers together to remove any gaps between the papers. 3. On one end of the paper weave, bend the ends over and stick down with double sided tape to secure. Cut any extra paper from the other end, leaving a 1cm allowance. 4. Cut any excess paper from the top, giving a 1cm allowance to folding over the paper on the inside. Stick an extra strip of to the inside of the paper pot at the top and fold all of the ends over and stick to secure. 5. Wrap the weaving around to create a circle and weave the ends together in and out of the pot to make it secure then stick them down with double sided tape. 6. With a contrasting piece of First Edition Kaleidoscope paper, cut a 7.5cm circle to fit inside of the pot. Cut the ends of the base, leaving 1cm to fold and secure to the circle inside the pot. Cut a 7.8cm circle with the same paper and stick to the base of the pot to cover the ends of the weave. 7. With your remaining strip of paper, stick to the inside of the top edge of the pot to cover the folded ends. 1. With two coordinating First Edition Kaleidoscope papers, cut around twenty 1.2cm strips. 2. Weave the papers together and cut to fit the Dovecraft 6” x 6” pearlescent card blank. 3. Cut four 15.2cm x 1.1cm strips of glitter paper and cut the ends off diagonally to create a frame around the edge of the card. 4. Die cut the third largest stamp die with the distressed green paper and stick the centre of the card to create a diamond centrepiece using foam tape. 5. With the Cricut Explore machine we have created a stag topper using red textured card, however you can use dies or toppers. Stick to the centre of the die cut stamp with 3D foam squares. 1. Cut a piece of First Edition Kaleidoscope inky purple paper into a 14.5cm square and stick to the centre of the Dovecraft Back to Basics 6” x 6” dark blue card blank. 2. Cut sixteen 1cm strips of Kaleidoscope paper and weave them together, push them close together to remove any gaps and make a square. 3. Add foam tape under the strips of paper to ensure the weave holds together. 4. Turn the weave so it looks like a diamond then cut the ends to fit on the background paper, we have created point on two ends and snipped different height diagonals on the other two. Fix to the card then add foam pads under every other paper end. 5. Stamp the ‘Let’s Celebrate’ sentiment onto the pink distressed paper and adhere to the centre using foam tape. Weaving is a lot of fun to try and great for using up paper scraps. We would love to see your versions of our weaving projects, simply upload and share them onto our project gallery.